The Carolina Horse Park, host of the Cloud 11-Gavilan North LLC Carolina International, will no longer be the site of the Stoneybrook Steeplechase. Photo by Lindsay Berreth. The Board of Directors at the Carolina Horse Park has elected to discontinue hosting the Stoneybrook Steeplechase. “The changing landscape of the local equestrian community and the exponential growth of other events hosted at the Carolina Horse Park have required the board of directors to reevaluate all lines of business. Upon careful review, the decision has been made to concentrate CHP resources on meeting the expectations of North Carolina’s equestrian community while focusing on those competitions that result in the largest economic impact to the region,” said a statement from the Carolina Horse Park. “While the Stoneybrook Steeplechase will be greatly missed from our calendar, I want to thank all of the members of our community that supported Stoneybrook over so many years and for all of the efforts of our Stoneybrook Organizing Committee,” said Bryan Rosenberg, chairman of the board of directors. The steeplechase started in 1949 at the Southern Pines, N.C., home of its founder, Irish steeplechase trainer Mickey Walsh. Following Walsh’s death in 1993, his farm was sold for equine land development, and the steeplechase track closed in 1996. The idea for the Carolina Horse Park, located in nearby Raeford, N.C., was developed in 1998 by a group of equine enthusiasts, and they created the nonprofit foundation to preserve land for horses. In 2001, the Stoneybrook Steeplechase was revived for its 50th running. 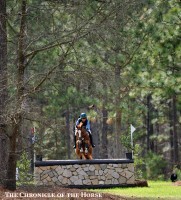 The Carolina Horse Park now hosts the Cloud 11-Gavilan North LLC Carolina International, the $20,000 War Horse Event Series and the annual Southern Pines Combined Driving Event, as well as numerous dressage, hunter/jumper and eventing competitions. Rosenberg said there are no plans to develop the grass race course. “It’s pretty early, but there are some things we could do with the field as it exists. Right now we’re not planning to change it. Right now it will stay as a grass track, and we’ll figure out how to best utilize that,” he said. Stoneybrook Steeplechase race director Toby Edwards is still hoping the race could be revived, but there are no current plans to relocate it. “They have not closed the door on Stoneybrook being held at that facility by any means. It will be relooked at in early January 2017, and hopefully we can get something back there for 2018,” he said.